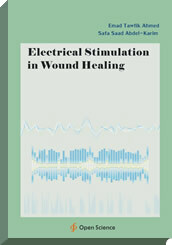 This book entitled “Electrical Stimulation in Wound Healing” consists of 4 chapters, 6 tables and 16 figures, which talks about what is the epithelial wound healing and how it can be measured and treated by the use of different types of electrical stimulation currents and what is the proposed mechanism of action of electrical stimulation. The book also gives clear evidence about the effect of these types of currents and gives the readers the parameters needed to achieve such an effect. This book can be very important for physical therapist, physical therapist Assistant, nurse, and all allied health professional who are working in the field of burn and general surgery. Emad Tawfik Ahmed is an Associate Professor of Physical Therapy at Faculty of Physical Therapy, Cairo University, Egypt. Dr. Emad T. Ahmed received his BSc, MSc and Ph.D. degrees from Faculty of Physical Therapy, Cairo University, Egypt in 1992, 1997 and 2001 respectively. He has worked as an assistant professor in physical therapy for surgery and plastic surgery since 2008 till now. His primary teaching and course development responsibilities include undergraduate and graduate level courses in Physical Therapy for Burn and Plastic Surgery, and Physical Therapy for General Surgery. His teaching and research interests include burn, wound healing, respiratory complication following general surgery. He works as an editor and a reviewer at many intentional journals in the field of physical therapy and rehabilitation. Safa Saad Abdel-Karim is a Physical Therapist specialist at Nasser hospital, Cairo, Egypt. Dr. Safa S. Abdel Karim received BSc degree in physical therapy from Faculty of Physical Therapy, Cairo University, Egypt in 1997. She upgrades her career by doing a diploma in nutrition from the International Congress for Alternative Medicine in 2011. Her primary interests are wound healing, and nutritional effect on burn patients. Medical field especially physical therapist, and physician. Students in the applied medical college. Post graduate students in the field of medicine and physical therapy.